Friend Road Dog just wrote about his recent trip from Dixon to DeKalb, Illinois. 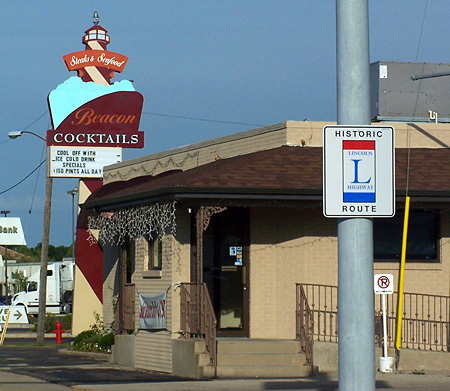 Sorry to say he reports that the The Beacon Inn restaurant in Rochelle is now a Chinese buffet and that the lighthouse was removed from its sign. Here’s a view in 2005, after it had been remodeled from the original. Read more of Road Dog’s posts at downdaroadigo.blogspot.com/. This entry was posted on February 16, 2010 at 9:43 am and is filed under food, highways, history, Lincoln Highway, Road trip, roadside, signs. You can follow any responses to this entry through the RSS 2.0 feed. You can leave a response, or trackback from your own site.